Order now for Christmas – Our Luxury Christmas Door Bow Decoration Kits include everything you need to dress your door for this coming festive holiday season. Our Christmas Door Bow Decorations are perfect for a front door at home, the office or shop fronts. The Christmas Door Bow Decorations arrives ready to use with full easy instructions to pop on your door within a few minutes. The Christmas Door Bow Decoration is made of a specialist material that will hold its shape, colour and style throughout the winter. Dress your door with our elegant Door Bow Decorations – adds a beautiful festive decoration to your front door, shop Windows, Party Entrances and Wedding – also wonderful to have a Door Bow Decorations to announce the new arrival of a baby or for a baby shower. We offer our popular Standard Door Bow Decorations or extra special Deluxe Door Bows Decorations. The Big Door Bows are 55cm wide, and the wings are 40cm tall. The Big Net Door Bows includes a beautiful sparkling diamante centre knot to add the perfect finishing touch to your home or building decor. We include co-ordinating material to wrap your door, pre-cut to fit your door and of course every pack includes very easy fit instructions. Our Big Door Bow Decorations are made of a specialist weather resistant net fabric that will not shrink, colour run or droop in rain, they are not made of a standard organza material you can buy online marketplaces. Many of our customer reported their door bows being in place for many months with no change to the quality and they have decided to use again next year and packed them away carefully. 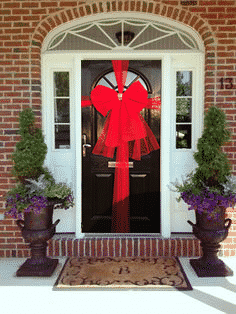 We offer Express Delivery options on our Door Bows. Bespoke Colour Combinations are also available – please call with your special requests. Original Bow Makers – We’ve been making big bows since 2003. Luxury Door Bows – Our bows are hand made with the highest quality specialist material to exacting standards. Your Decorating Pack includes the Door Bow, Pre-Cut Door Wrapping Material and very easy to understand instructions – if you can wrap a present you can wrap your door. Easy to Fit – Our bows have an easy to fit design and come with both written & Pictorial instructions. We’ve been making bows since 2003 – you won’t be disappointed. Want to Sell Our Door Bows? Door Bows all over the world!